As the year draws to a close we are going to ask you to click on this link and to look through our 2014 Lost Dogs Album one more time. Although we have had an incredibly successful year (over 1900 reunions so far) we have many dogs that we are still searching for. Where are they? In this blog post we’ll take a wild stab at our best guess (based on what we have learned over the last four years). Many people fear that their dog has been eaten or killed by coyotes. We do not find this to be common and very few of our deceased dogs have evidence of being killed by a predator. Is it impossible? No. But dog/coyote altercations are almost always territorial (the dog is defending his yard or his territory) and scared, lost dogs are not territorial. They will defer to a larger predator. Lost dogs simply want to survive – so they need to do three things – they will hide from predators (including man) and they will spend their time sleeping and travelling between their food sources and hiding places. If a dog is killed by a larger predator – the body will usually be found. Predators do not tend to eat other predators and all members of the canine family are predators. Some of our still missing dogs wandered far beyond their “jurisdiction”, out of the flyered area, and end up in the maze of animal sheltering and animal control. They may have been adopted to a new family or put down when their 7 day stray hold was up. These are a heartbreaker for us because the simple act of posting pictures on line of impounded found dogs would bring most of these dogs home. Our dedicated volunteers and fans scour the internet watching for possible matches but they cannot do this when there are no pictures available. 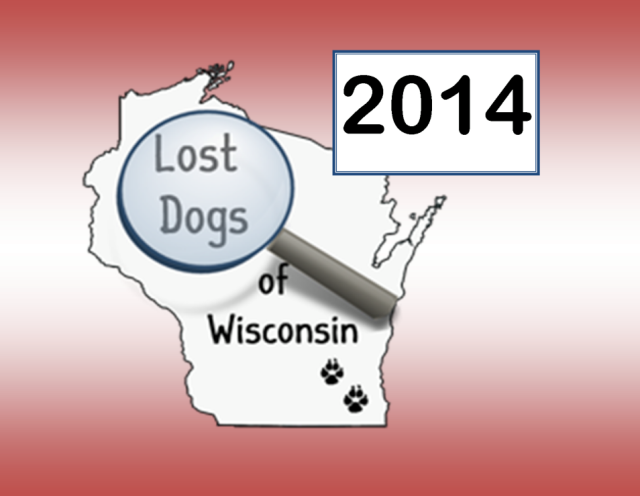 Many Wisconsin shelters still do not reliably post pictures of impounded found dogs. Please ask them to do so. It is perhaps the simplest way to save lives and free up shelter space for those dogs that truly need it. The last component (and probably the largest) are lost dogs that have been picked up by a Good Samaritan who meant well but then kept or rehomed the dog without searching for the owner. Of course, this is illegal in Wisconsin, but it happens all too frequently. The current “rescue” phenomenom that is sweeping our country has kind -hearted people making false assumptions about the owners of a dog they find. They speculate that the dog has been abused, neglected or “dumped” and needs a new home. We have great success when we can get the finder to file a report with us so that we can post a flyer online. This serves to dispel the false notion that people that have lost their dog don’t deserve him/her back. We ask all of our fans to please spread the word to their friends, family and neighbors – Lost dogs don’t need a new home. They just need to go home. Do not assume that you can keep a dog that you find. He/she is somebody else’s personal property and keeping him/her is illegal. Thank you for helping us. Please take a few moments, scroll through our lost and found albums, and maybe, just maybe we can help reunite a few more of these dogs in 2014. This entry was posted in Our Organization, Still Missing. Bookmark the permalink.